Summer's now well established, and as the days have been getting warmer, scarves have been taking a little bit of back seat. On cool fresh mornings and evenings they still come out, but I wear them in loose drapes and folds, or as a belt. 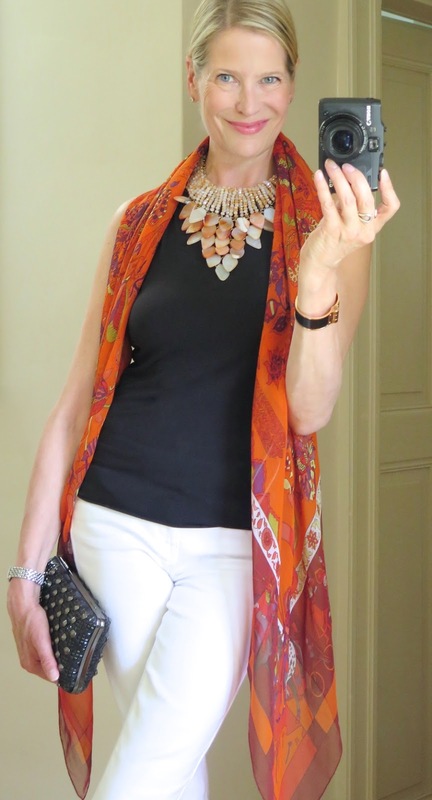 As the temperature goes up, I rely on necklaces to give my summer outfits a touch of color and chic. 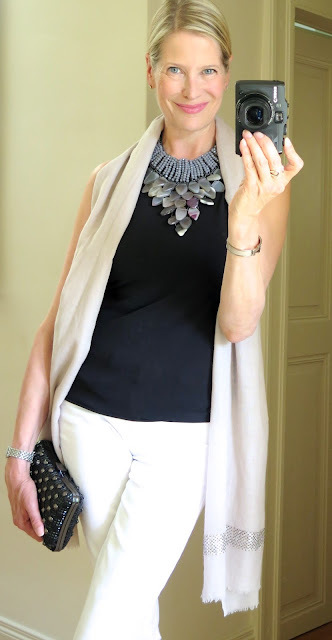 I love wearing them in combination with a scarf, but when it gets too hot and the scarves have to be stored away, a necklace can always pull the look together instead. Very happy to introduce two beautiful new waterfall necklaces today... both are light and easy to wear statement pieces, and entirely made by hand. 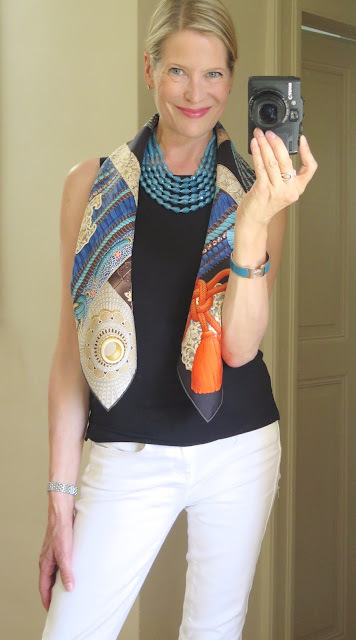 I selected eight capsule wardrobe pieces (details at the bottom of the post) as a canvas on which to play with the new necklaces and also some of my favorite summer scarves. 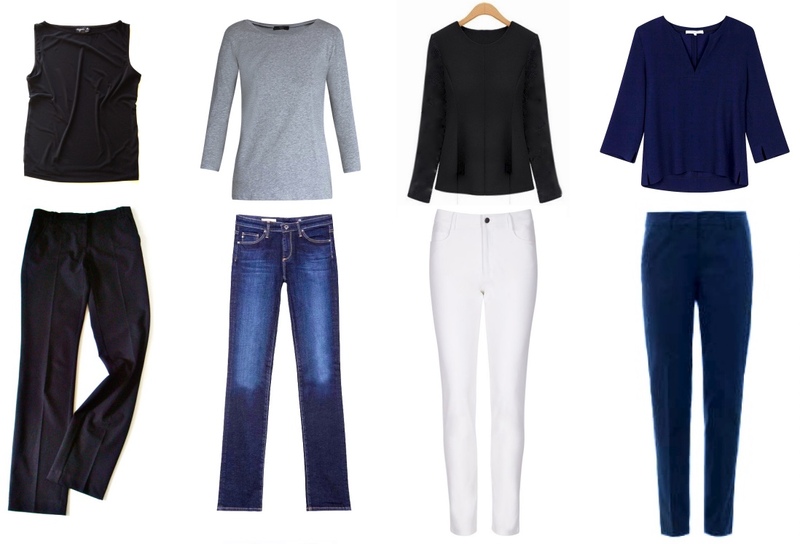 The capsule pieces may look sombre at first glance, but they are easy to mix and match and go from day to night, which makes them a perfect summer travel wardrobe, too. The suggestions below are just some of the many possible combinations which you can use to brighten up these pieces and give them a summery touch. Hoping that you enjoy the post and have a wonderful summer! 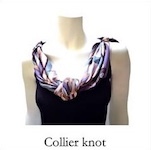 Accessories provide the perfect opportunity to highlight specific colors or parts of your scarf, and give a focus point to your outfit when the silk becomes too warm around your neck. 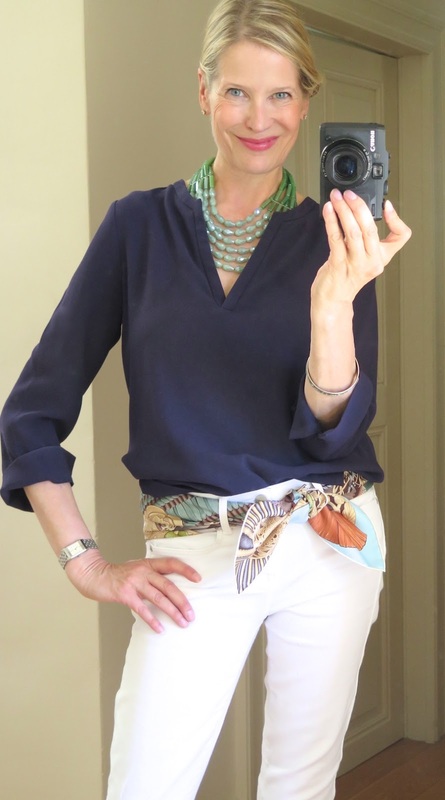 Bringing out the blues of a Parures de Samourais (CW05) with a crystal waterfall necklace in Duck Blue (available here) and an Hermes Clic Clac H bracelet in Bleu Indiens. 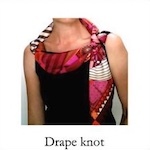 It's always fun to discover how to fold a scarf to bring out its different parts and colors. 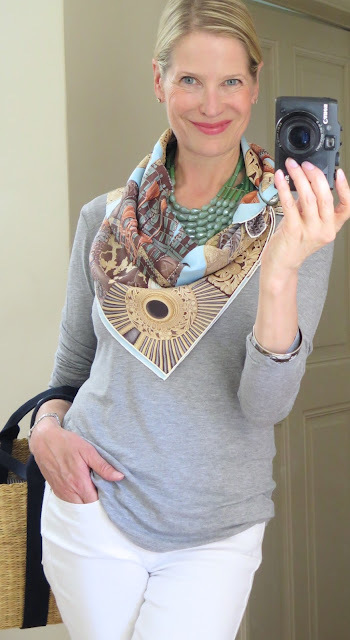 Here folding the Parures de Samourais (CW04) into a wide basic bias and wearing it as a belt with the ends secured in the basic slide behind the back, which almost completely eliminates the beige elements, making it look like a different scarf. 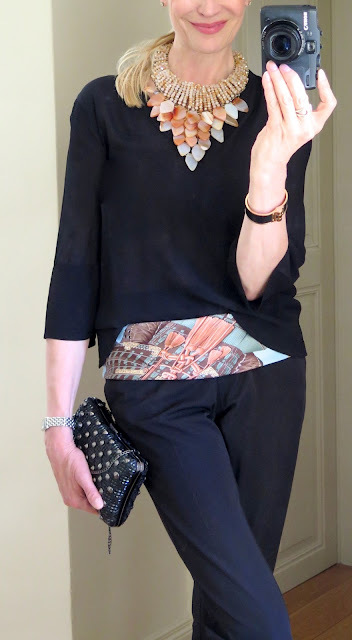 Also wearing an Hermes Charniere bracelet in rose gold/black lizard and a MaiTai Collection Gemstone waterfall necklace as above. Clutch by Zara. Right: 90 carré travel pochette filled with four Hermes 90 carrés: Parures de Samourais CW 04 and 05), Zebra Pegasus and Aux Pays des Epices. MaiTai Collection Crystal Waterfall necklaces (Duck Blue, Vert Nil, Champagne and Dove Grey) on top. So pretty! Now, I want to buy about 5 new scarves and all your travel collection pieces AND some jewelry. =). Beautiful. I have a question. 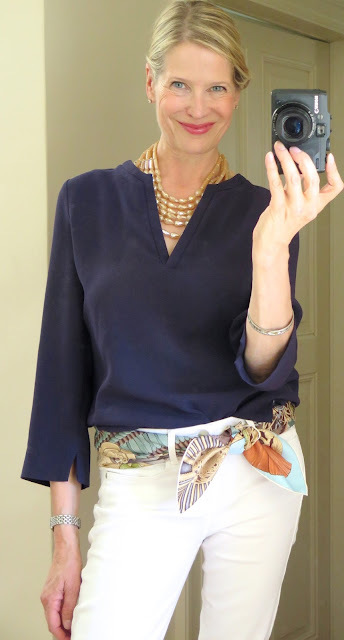 After you use a scarf as a belt it's going to have fold lines in it and wrinkles where you tied it. Do you press it with an iron or send it to the cleaners? Hope YOU are having a BEAUTIFUL SUMMER!!! Some beautiful pieces you've created. I love the summer sorbet colors. Many of them look good enough to eat! My scarves aren't in the back seat at this point or even in the picture. The heat index was 100 here today - definitely the time to turn to your necklace creations. The scarves are on vacation. Just wish I was! 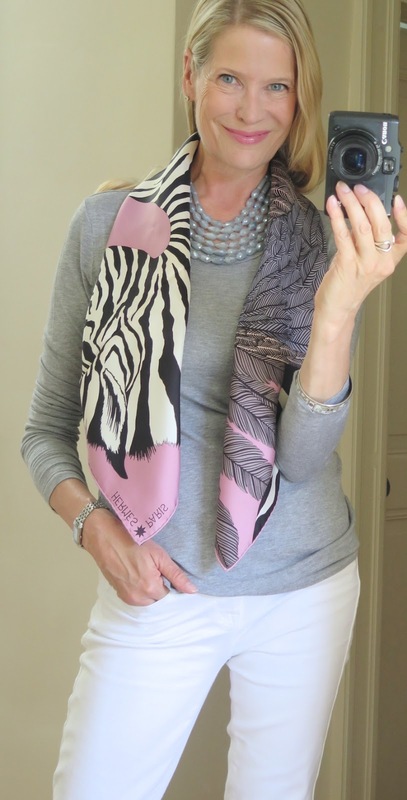 I'm with Jerrine--the Southern swans need a cooler clime to enjoy our scarves, or especially the new pajamas--which I'm sure come with complimentary sweet dreams! Mai Tai, the necklaces are so lovely, and I love Jerrine's description--summer sorbet colors that look good enough to eat! That's high praise from the land of too hot to even move! I love how you continue to inspire us with new ideas and new worksheets (for those of us who need a little extra help!). Cooler clime? Heck, we need a frozen tundra at this point. I feel like I'm living in some sort of tropical rain forest/jungle, and it's making me very grumpy. I could bite the head off a snake at this point! I used to love summer when I lived up north, but down here I start dreading its arrival about February. I wonder if "I can't wear my Hermès scarves down here" is an acceptable reason to move? Thank heaven our girl understands our plight and comes up with beautiful treats for the summer accessory challenged. Hang in there, Greta. November is right around the corner! Oh my! Jerrine, our area has been inundated with snakes due to the recent rains--apparently they don't like them either--and there are awful stories about people being bitten as they reach down to pick up something dropped. Horrors! But I digress (it's the heat)...the thought of you biting the head off a snake was almost shocking enough to make me drop my tea cup! That's grumpy! MT, our fair leader, you look so fresh and chic in your photos! 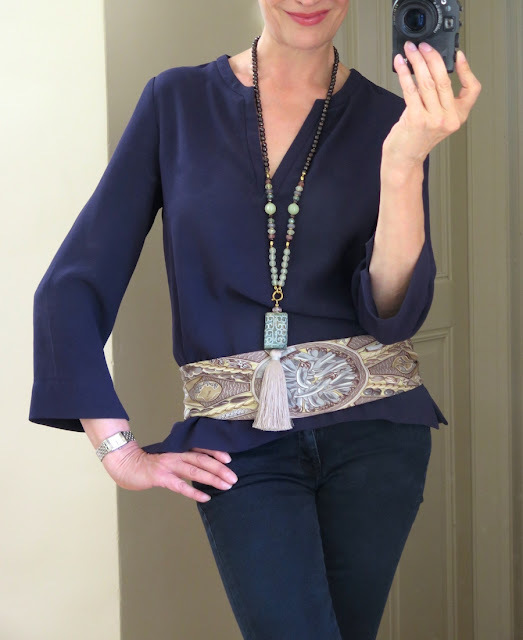 Thanks for giving us more new ideas--a scarf as a belt! What a concept! Love the new necklaces! Congratulations on all your very beautiful necklaces. I would by them all right away if I could. They are so pretty and their colours just perfect. I do hope they don't sell out very fast. I pressed the button too quickly. Your new necklaces are stunning, I will take a closer look. I am using my MaiTai travel pochettes a lot - keeping scarves, shawls, Twillys, scarf rings and even jewelry inside. They make great travel companions! Just as the hot,humid,hazy days of Summer have lulled me into the wardrobe doldrums, you come along with these beautiful style sheets to chase away the malaise! You look so fresh and beautiful in each inspiring shot and your new MT collection necklaces really do add a refreshing punch! I am heading over to the shop to check them out! Happy days to all gathered here! Yes I agree with everyone, your new lacklaces are really beautiful and You stunning. Thank you, dear Monica. Belle semaine et amitiés. These necklaces are absolutely beautiful. I love the floral pictures also. Thank you very much Kelly, so happy you like the necklaces and pictures.